Successfully Added Ultrasonic Jewelry + Watch Cleaner (EU - Edition) to your Shopping Cart. Cleaning your entire jewelry collection is style with ease and simplicity. 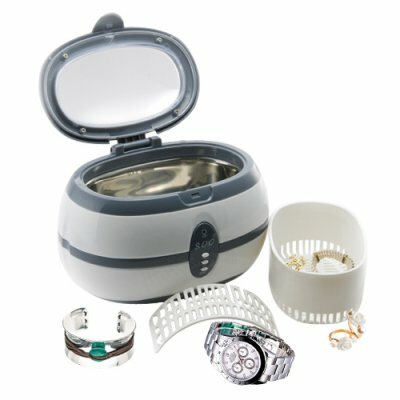 Just fill the ultrasonic jewelry and watch cleaner with 600ml of water, and let the magic begin. Do you have some favorite necklaces or watches that really need to be cleaned but you find yourself lacking the time and money to take them to the jeweler to have them taken care of? Well, no worries with the CVKE-G113 Ultrasonic Jewelry + Watch Cleaner you can now take care of them in the convenience of your home. How does this product work? This fantastic new high-tech product emits 40,000Hz of ultrasonic waves that cleans almost any item in only THREE MINUTES. The Ultrasonic Jewelry + Watch Cleaner makes your necklaces, rings, earrings, bracelets, coins, glasses, watches and much more look as good as new. Click "Add to Cart" now to have us instantly ship a sample of this unit to you today. Then order more to resell on eBay or your own internet storefront. The Digital Ultrasonic Jewelry + Watch Cleaner is brought to you exclusively by the leader in factory direct wholesale electronics, Chinavasion.